HOW DOES THE ELEXOMA WORK? The brain contains nearly 90 billion neurons - nearly as many stars in the Milky Way! What is more, each neuron connects to thousands of other neurons, resulting in trillions of connections. All these neurons are constantly talking to each other, using chemistry to produce electricity. Each electrical signal carries a message that changes some part of the body. But what happens when things go wrong? When signals don't reach their target organs or other parts get too many signals? The traditional response is to use chemicals to direct the electrical signals differently (a bit like using a shotgun to kill a fly). These drugs have side effects that can even be life-threatening at times. 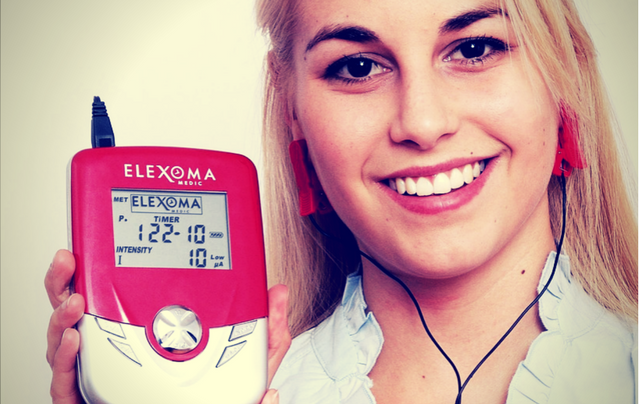 What the Elexoma Medic does is it increases the energy inside the neurons by 500 to 800%. It provides tiny electrical impulses to the body, stimulating cells to make a range of chemicals essential for peak performance. When applied to the brain, the nerve cells are stimulated to communicate faster and better. The brain uses this extra energy to improve performance. WHAT CAN THE ELEXOMA BE USED FOR?